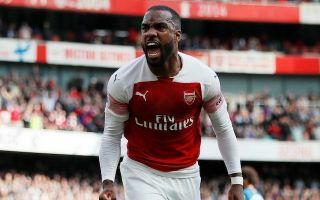 Arsenal striker Alexandre Lacazette has paid a big tribute to manager Unai Emery after today’s 4-2 win over Tottenham in the North London Derby. The France international credited the manager’s enthusiasm and tactics as being what pushed the team to victory as they continued their fine unbeaten run. It’s now 19 games without defeat in all competitions for Arsenal, who started badly with two consecutive defeats in Emery’s first two competitive games in charge. However, those were challenging early fixtures against Manchester City at home and Chelsea away, and the Spaniard has been able to turn things around in a very impressive way since then. While Arsenal’s football hasn’t always looked as slick as under Arsene Wenger, they’ve developed a new-found ability to grind out wins even when they’re not at their best. Today was another example of Arsenal overcoming early setbacks, going in 2-1 down at half time but still having the belief in their game plan to come back and score three without reply in the second period.